Hopefully the writer does not mind me reposting it here. It is a very thorough and well done story, and there was much that I did not know before. They included a description of Cynthia, phone numbers for contact information, and even the address of her website. The one more thing they could have included was a picture. The date on the page was July 8, so it is probably quite up-to-date. In this week's edition of "The Missing," we revisit the mysterious disappearance of Cynthia Louise Day, a 38-year-old resident of East St. Louis, Illinois, who went missing on Aug. 10, 1990. "I was 18-years-old and fresh out of high school when my mom disappeared," Cynthia's daughter, Melody, said in a telephone interview with Investigation Discovery. "On the day she went missing my sister, Kimberly, had just come home from the hospital with her son. My mom was excited, so my sister and I went over to her house so she could get to know her new grandbaby. My mom took him around and proudly introduced him to all the neighbors. We had a good time. We did not know it when we left, but that would prove to be the last time that we ever saw her." Approximately one week later, Melody and Kimberly became concerned because they had not heard from their mother. It was unlike her to stay out of contact for such a long period of time, so the girls decided to go check on her. To their surprise, their mother, along with her boyfriend of seven years, had vanished. In addition, all of their possessions were also gone. "My mother was into beauty and fashion and everything – clothes, makeup, perfumes – was all gone" Melody said, adding, "We did not even find a single toothbrush." Both girls were young at the time and neither of them had any idea what to do, so they went to the East St. Louis Police Department and filed a missing person report. It was their hope that the police, people they felt were skilled and knowledgeable in missing person cases, would be able to uncover the mystery of their mother's disappearance. "With each year that passed by, I just assumed that the police were investigating the case," Melody said. "I would call them whenever I heard they had found a body and would check to see if it was my mom, but they always said it was not her. Then, in 2004, when I needed a police report to get the website going and all this stuff, I discovered that they had never even opened a case. We resolved the issue but from that day forward I decided to do everything in my power to find out what happened to my mother." As part of her own investigation, Melody went back to the neighborhood where her mother had lived and discovered that many of her mom's old neighbors suspected that Cynthia's boyfriend had something to do with her disappearance. This was something that Cynthia's daughters had also considered because, according to Melody, their mother had allegedly voiced her unhappiness about the relationship the last time they spoke. In addition, there was another incident that had occurred prior to Cynthia's disappearance, which her daughters found troubling. "Sometime before they went missing, my uncle Wayne supposedly shot himself in front of my mom and her boyfriend," Melody said. "The entire thing is strange and my family is convinced that Wayne did not commit suicide. We think that something happened to him and that my mom witnessed it." The case took another unusual twist about five years ago, when Melody discovered her mom's boyfriend was being held in a California Prison. She cannot recall the exact charges but said she believes they had to do with an armed robbery. "He never once contacted us to tell us that our mom was not with him," Melody said. "Why didn't he say, 'where's my old lady, where's your mom?'" According to Melody, an officer in California questioned her mom's ex-boyfriend but he claimed to have no knowledge of what happened to her. "The officer in California who questioned him told me he is convinced this guy did something to both my mom and my uncle," Melody said. "He gave my local police department permission to come down there and question the guy but they said they did not have the money. I offered to buy the plane tickets myself but they would not take me up on the offer." The boyfriend was paroled from prison two years ago and to date Illinois investigators have yet to question him. "Getting the cops to do something is like pulling teeth," Melody said. "I've been the detective on this case for a long time. Two plus two equals four and if the police had done their job they would have had this case solved a long time ago. To know that the cops are not doing anything is frustrating. They take more interest in an animal stuck in a tree than a missing person. We know my mother is not alive, we just want to put her to rest whatever way we can." When asked what she would like to say to her mother, Melody responded: "I love and miss you so much. I am still looking for you all these years later and will continue to look for you until I find you. You have a beautiful family that is still hopeful. We will do whatever we can to keep your memory alive." trying to run that through our database to see if we get any pop-ups on any Jane Does we have found … I am not actively investigating the case and cannot answer any further questions at this time." Stewart referred further questions to the investigator who is handling the case for the Illinois State Police; however that investigator was unavailable for comment. Cynthia Louise Day, nickname "Peaches," would be 55-years-old today. She is described as a white female, 5'2" tall, 125 lbs., with blonde hair and blue eyes. She has a hysterectomy scar and is missing an eye tooth on the left side. Anyone with information is asked to call the East St. Louis Police Department (Case # ES-04-06787) at 618-482-6724 or the Illinois State Police at 618-346-3781. For more information or to help, please visit: http://www.findcynthia.com/. Also, according to the latest posts on Cynthia's guestbook, her flyer will be displayed at a missing persons' rally in Waterbury, Connecticut, on August 23. 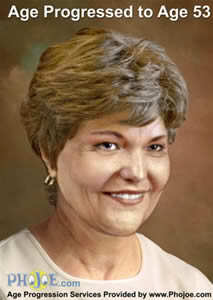 She is also one of the missing persons being honored in the making of a special quilt, which will also be at the rally. You can print a poster of Cynthia at http://www.theyaremissed.org/ncma/gallery/ncmaprofile_all.php?A200401797S. She would be 58 now. Melody is my friend on FB. This just is NOT right!! !